Markets have closed lower on the first day of Samvat 2072 tracking weak global cues along with significant selling among capital goods, FMCG and IT shares leading the fall. Further, the annual industrial output grew at a slower-than-expected pace of 3.6% in September, dampened by a slower expansion in the mining sector, government data showed on Thursday. Also, the retail inflation climbed to a four-month high in October as food prices escalated on supply deficiency in pulses. Lower industrial output in September raised concerns that the economy is on the growth track while rise in consumer inflation dashed hopes of a rate cut by the central bank. 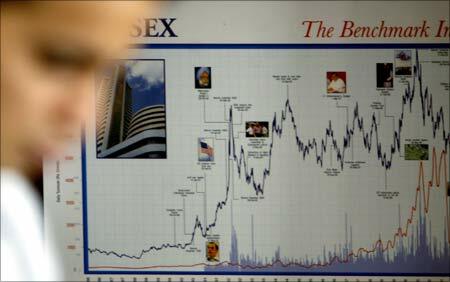 The 30-share Sensex closed lower by 256 points at 25,610 and the 50-share Nifty was down 63 points at 7,762. The broader markets underperformed the benchmark indices- BSE Midcap and Smallcap indices were down 0.7-1.4%. Market breadth ended weak with 1,649 losers and 936 gainers on the BSE. In the currency front, the rupee was trading higher by 17 paise at 66.14 to the US dollar after exporters pressed sales in the US currency. According to Motilal Owsal’s market report, “The down trend may drag index to 7750 levels from where one can expect to see some relief rally”. Asian shares fell sharply on Friday after commodity prices tumbled to multi-year lows on worries that slower global growth may worsen a supply glut, while US Federal Reserve officials kept drumming up the case for a rate hike next month. MSCI's broadest index of Asia-Pacific shares outside Japan dropped 1.5%, led by losses in resource shares. It was set for a weekly decline of 3.2%. Japan's Nikkei closed down 0.5%, snapping a seven-day winning streak, but remained on track for a weekly gain of 1.7%. The Shanghai Composite index slipped 1.1%, and was poised to end the week flat. BSE FMCG and Capital Goods indices slumped by almost 2% followed by counters like Healthcare, IT, Auto, Oil & Gas and Realty, all declining by 1% each. However, metal and Consumer Durables sectors ended in positive zone. The top losers from the Sensex pack were Vedanta, Hindalco, Cipla, ONGC, TCS, Bajaj Auto and L&T. Metal shares reeled under selling pressure as global commodity prices have declined significantly. Shares of interest rate-sensitive sectors such as banking, real estate and autos ended lower on the back of disappointing macroeconomic numbers as investors become cautious and focus on the tone of the central bank at a time when industrial growth fell to a four-month low of 3.6% in September and the CPI inflation for October rose to five per cent - the highest in four months. The fifth bi-monthly monetary policy of the RBI is scheduled on December 1, 2015. Capital Goods shares declined because the annual industrial output grew at a slower-than-expected pace of 3.6% in September. On the gaining side, Coal India, Axis Bank, Tata Steel, Reliance Inds and Bharti Airtel surged between 0.3-3%. State-run Coal India gained by nearly 3% after company invited bids from international companies in order to establish a washery in Jharkand. Tata Steel firmed up after the company received green nod for expansion as well as setting up of two units at its Joda plant in Keonjhar district, Odisha, entailing an investment of over Rs 185 crore. Bharti Airtel today said it intends to issue Sterling Bond of up to GBP 500 million (around Rs 5,000 crore), which will be listed on the London Stock Exchange. The stock gained 2%. Shares of InterGlobe Aviation extended its gain and surged 10% at Rs 1,009 on the BSE after making a spectacular trading debut on Tuesday with shares in its parent company InterGlobe Aviation surging as high as 18% above their listing price. Shares of CESC rose 3% at Rs 545 after the company reported increase in net profit on the back of lower fuel costs. SpiceJet dipped 4% to Rs 48 on the BSE after the company reported 67% sequential drop in the quarterly profit at Rs 24 crore in the September quarter as against Rs 72 crore in the June quarter. Indiabulls Housing Finance slumped over 11% after the company announced yesterday that it will acquire a 39.76% stake in the UK's OakNorth Bank for USD 100 million (about Rs 661 crore).